balance shaft chain guide bolts 156 in. lbs. balance shaft sprocket bolt 27-39 ft. lbs. balance shaft thrust plate bolts 69-95 in. lbs. camshaft bearing cap bolts 14-19 ft. lbs. camshaft sprocket bolt 37-40 ft. lbs. cylinder head-to-Timing chain cover bolts 12-16 ft. lbs. cylinder head bolts step 1 21 ft. lbs. step 2 42 ft. lbs. step 3 59-64 ft. lbs. crankshaft pulley bolt 131-144 ft. lbs. exhaust manifold bolts 16-20 ft. lbs. flywheel bolts 68-72 ft. lbs. intake manifold bolts 14-18 ft. lbs. main bearing cap bolts 61-65 ft. lbs. oil jet valves 104-156 in. lbs. oil pan bolts 70-95 in. lbs. oil pump body bolts 14-18 ft. lbs. oil pick-Up tube bolts 70-95 in. lbs. oil pump pressure relief valve 28-44 ft. lbs. rear main oil seal housing bolts 70-95 in. lbs. rod bearing cap nuts 48-50 ft. lbs. thermostat housing-to-Engine 6mm Bolts/Nuts 5-7 ft. lbs. 8mm Bolts/Nuts 12-17 ft. lbs. timing chain/Balance shaft chain access cover bolts 70-95 in. lbs. timing chain cover bolts 14-18 ft. lbs. timing chain guide bolts 70-95 in. lbs. valve cover bolts 52-78 in. lbs. water pump bolts 104-122 in. lbs. Fig. 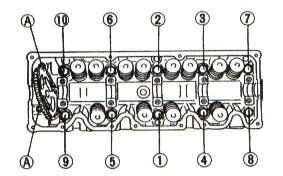 1 Cylinder Head Bolt Torque Sequence. Fig. 2 Cylinder Head Bolt Loosening Sequence.